I have been a lifelong boxing fan. When the news came that Muhammad Ali had passed, I felt saddened and depressed. It was not the depression or grief of losing a friend or loved one. It was as if my world sensed that there had been a tragedy and I felt the loss. I am old enough to remember Ali defeating Sonny Liston as Cassius Clay for the title. I can also remember in those times not liking or respecting the man very much. He had great talent and ability which no one who appreciated boxing could deny. I just despised his arrogance and taunting. I hated his fighting style which seemed disrespectful of opponents. He could even display cruelty to opponents. In one match I recall, against Ernie Terrell who refused to call Ali by his newly acquired Muslim name, he toyed with the far slower opponent and ruthlessly pummeled him with punches all the while yelling at him, “What’s my name?, What’s my name?” over and over. He ‘carried’ this fighter for the entire distance of the fight, 15 rounds, deliberately hitting him with hundreds of punches designed to punish him while not knocking him out so he could prolong the beating. How do I know this? Because Ali boasted about doing it to this guy before the fight! 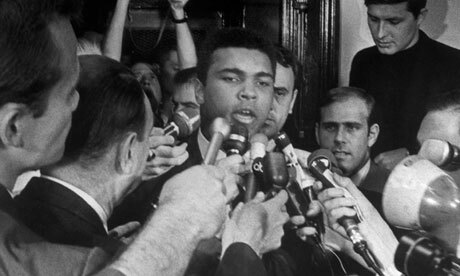 Then Ali refused induction into the military as a protest against the Vietnam War. That action just increased my dislike of him, probably because I had an older brother who had fought in Vietnam. Something happened next which began a change of opinion in my mind concerning Ali. He served his prison time and suspension from boxing for draft evasion (unlike so many who ran to Canada to escape) and actually came back to earn a shot at the title. Ali lost that title match to Joe Frazier and I was rooting for Frazier all the way. Yet, after this match and the other two epic matches with Frazier along with more title fights, Ali accomplished the unthinkable, losing the title twice more and regaining it twice more! Along the way my respect for him grew, begrudgingly, and I began to realize that I was watching an absolute boxing genius, as well as a man of rare courage both in and out of the ring. Don’t mistake me here. I was not in agreement with a lot of Ali’s beliefs, societal and especially religious. I truly wish he would not have embraced Islam. I never liked his arrogance and showy manner and insults to opponents, though I realized much of it was geared to filling the seats and enlarging the purse. Yet, I could never deny Ali’s sincerity of belief or courage of expression of them. Those who are real boxing fans could never deny his skill as well as his will. When, later in his career, the man who could “float like a butterfly and sting like a bee,” began getting ‘stung’ more, Ali’s courage as a fighter came through as well. Now he is gone, succumbing to the horrible ravages of Parkinson’s disease. Most would attribute the disease and his death to the punishment Ali received as a boxer. In light of Ali’s death, we again see calls from many to ban boxing outright because of the risk of such conditions due to head injury. I must respectfully disagree. I don’t wish to minimize the gravity of the health concerns of a sport such as boxing, nor the innumerable people who suffer from such conditions as Parkinson’s. I also believe there is much that could be accomplished to make the sport safer, one being a National Boxing Commission similar to other major sports leagues. But I must disagree with banning boxing outright because of the risk involved. There is risk in boxing as there is in so many other competitions, and in fact as there is in life! To live a life without risk is to live a life without living. Does anyone think Ali never considered the risk not only of losing, but of injury and even death in the ring? I also disagree a boxing ban for a selfish reason. I wrote at the start that I am a lifelong boxing fan. I am in fact a fan of the science and strategy and sweat and sacrifice of the sport itself. Watching Ali battle in the ring seemed to me like watching all of that and a warrior spirit combine in sublime perfection, the like of which I will not see again. Without boxing and without Ali to perform it, I and many others would have missed that glimpse of greatness and be poorer for it. Lastly, I disagree with a boxing ban specifically tied to what happened to Ali. Is what happened tragic? Very much so. However, a greater tragedy would be if boxing had already been banned when Ali came along. Would he have died from Parkinson’s if that would have been the case? Probably not. Would Ali have touched millions worldwide with his charity and advocacy if boxing hadn’t existed for him? Most certainly not. All of his fame, fortune, adulation and worldwide adoration came because he was the Heavyweight Boxing Champion of the World first. So, I will remember the style, and grace, and heart and charity of this historic figure, Mr. Muhammad Ali both outside and inside of the ring. He was indeed, “the greatest of all time”, and he will be missed.